JMAG News published a series on anime pilgrimage locations for Yurucamp, including four location reports covering Yamanashi City, Lake Shibire, Minobu, Lake Motosu and Fujinomiya, and an interview with Mukawa Kiyoshirō (武川清志朗) from the Yamanashi Tourism Promotion Organization (やまなし観光推進機構). The interview is the most interesting part, in which Mukawa talks about the thought process and preparations that went into creating the website promoting locations as they appeared in the series, and communicating with local stakeholders about creating an environment to receive anime pilgrims and opportunities for tourism revenue. Mukawa says the Organization had not previously supported promotion based on an animated work, and the decision to commit resources to the project was made without knowing whether the series would be popular or not, but considered it a worthwhile risk to anticipate tourism rather than begin from a reactive position. 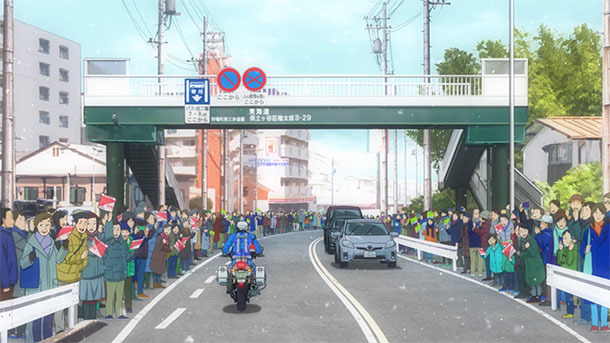 Despite a trend of media criticizing behavior of anime pilgrimage fans in 2018, Mukawa says his encounters with visitors gave him the impression that Yurucamp fans are on the whole well-mannered. Seichikaigi volume 25 features an interview with reporter Hashizume Mitsuru (橋爪充), Deputy Chief of the Eastern Japan Bureau at the Shizuoka Shimbun, who is responsible for the paper’s regular coverage of anime pilgrimage and contents tourism in Numazu for Love Live! Sunshine!! since the series first aired in 2016. Shizuoka Shimbun published an article about a recent survey conducted by Shizuoka Eiwa Gakuin University sociology professor Mōri Yasuhide (毛利康秀), finding over 80% of Love Live! Sunshine!! fans traveling to Numazu are repeat visitors, of which about 60% have visited 10 or more times. Only 16.9% responded as first-time visitors, compared with 31.9% when the same survey was conducted in 2017. NHK published a history of the Heisei era told through keywords, including the term seichijunrei and films Kimi no Na wa. and Kono Sekai no Katasumi ni in the section for 2016. Nishi Nihon Shimbun published an article about seichijunrei to Nagasaki for Irozuku Sekai no Ashita kara, highlighting the Mori no Majo Cafe for its importance as a location both in the fictional work and as destination and meeting place for fans, despite its location far from the central business district. Saga Shimbun published an article about the March 14 release of its special edition Zombie Land Saga pilgrimage guide, which includes interviews with voice actor Hondo Kaede (Minamoto Sakura), Cygames president Koichi Watanabe and director of animation Takenaka Nobuhiro. Merumo published an article detailing the experience of completing the Code Geass digital stamp rally managed by the Tokyo Anime Tourism Executive Committee and Anime Tourism Association, running from February 9 to March 25. @flyingbird1124 made a pilgrimage to Nakano Ward and Shinjuku Ward, Tokyo Metropolis for Kemurikusa Episode 10. @flyingbird1124 made a pilgrimage to Shibuya Ward, Tokyo Metropolis for Revisions through Episode 10. @flyingbird1124 made a pilgrimage to Shibuya Ward, Tokyo Metropolis for Boogiepop wa Warawanai Episode 1. @mikehattsu made a pilgrimage to Narita Airport for Love Live! The School Idol Movie. @flyingbird1124 made a pilgrimage to the Aoyama Kaidō crossing in Sendagaya, Shibuya Ward, Tokyo Metropolis for Fumikiri Jikan. @Bf109K1 made a pilgrimage to Yamanashi City, Yamanashi Prefecture for Yurucamp. @flyingbird1124 made a pilgrimage to Shibuya and Shinjuku, Tokyo Metropolis for Blend S.
@mikehattsu made a pilgrimage (post 2, post 3) to Odawara, Kanagawa Prefecture for Love Live! @yomikatajiyu made a pilgrimage (post 1, post 2) to Chōshi, Chiba Prefecture for Amagami SS. @yomikatajiyu made a pilgrimage to Koraibashi, Chūō Ward, Osaka for K-On! @yomikatajiyu made a pilgrimage to Yawata, Kyoto Prefecture for Clannad After Story.